I’ve been flying Elite Class from LAX to Taipei for a number of years. I rave about it to family and friends as the quality compared to economy, and more specifically U.S. airlines is so much better. People often ask me if it is really worth the extra cost to fly premium economy, my answer is always YES! It typically costs me at least an extra $400 to book premium economy. My rationale for this expense is that I will be traveling for over 24 Hours on my way from home to my final destination of Bangkok and any creature comforts to make that journey more enjoyable is worth the cost. As long as I can afford it. If I could afford a business class ticket I would certainly be flying Premium Laurel, but I can’t. Elite class is better than domestic first class, and equivalent to business class seats on a lot of U.S. based carriers – for half the cost. Let’s take a look at what makes this class of service a no-brainer for me. Check-in is easy when you are booked in EVA’s Elite class. There are a dedicated line and counter that has rarely been busy in all the times I’ve flown. With only 64 seats in premium economy, everyone would have to arrive at once for there to be longer than a few people waiting in line at the same time. Another nice feature of traveling in Elite class is priority boarding. You are assigned group two boarding which gets to board right after the Royal Laurel (Business Class on the 777-300). 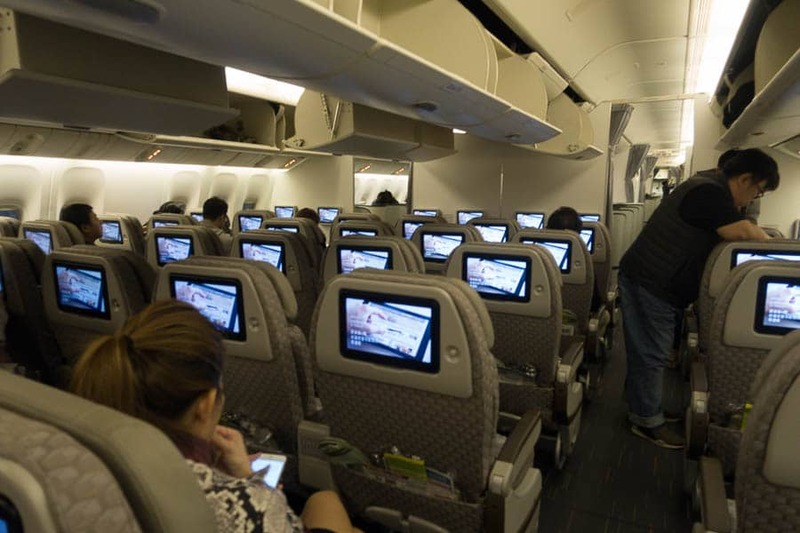 It allows you to get on the plane, get your carry on stowed and settled in your seat before the mass of passengers in economy start to stream onto the plane. Both of these little perks lead to a low-hassle experience. The premium economy class on EVA 777-300ER is setup in a 2-4-2 configuration (seat map). On long haul flights like this one from LAX to Taipei, I prefer an aisle seat. Actually, I’d rather not travel if I can’t have the aisle as I like to get up and walk about or use the lavatory without having to wake or climb over someone. The seats are quite comfortable with plenty of legroom. The seat pitch is 38”, 5” more than in regular economy. They are also an inch and a half wider. This doesn’t sound like much, but it makes a big difference when combined with the wider armrest. The seats have a decent recline, they are nowhere close to the lie flat seats in Royal Laurel but much better than economy. The headrest is able to be folded to support your head which takes away the need for a travel pillow which I find very uncomfortable anyway. The seats come with a bottle of water, pillow, blanket, over the ear headphones, a small amenity kit, and slippers. There is not any additional storage other than the seat back pocket. I’ve been fortunate that I have had an empty seat next to me on both legs of the flight so not only does it seem roomier, it gives me a place to keep my stuff on the long flight. I find that the Elite Class has abundant legroom as I mentioned earlier, which is a real plus. It really helps not only for your comfort, but if you are sleeping and someone needs to climb over you to get to the aisle, there is more of a chance that they can do it without waking you. One thing I did notice that in some of the seats the in-flight entertainment box is placed under some of the seats restricting where you can place your feet. They have done a much better job of keeping these out of the way on the newer 777-300ER planes, but still something to be aware of. Each seat in premium economy comes with its own power plug and USB port for charging your devices which are critical on a 14-hour flight. I was able to land with a full charge on all my devices. EVA Air has onboard Wi-Fi available for a charge. While I never found a need to use it in the past, I did on this trip. Before I boarded my plane in LAX, I still had not heard a confirmation from my taxi company that they would be there for pickup in Bangkok and I reached out to a second taxi service. I was still awaiting replies from both when it was time to board. Eva offers Wi-Fi service from T-Mobile. You can choose from a couple different packages. They offer a 1, 3, and 24-hour package. I opted for the 24-hour package at $21.95 since it was such a long flight. I was skeptical whether or not the Wi-Fi would work well as we cruised across the Pacific at 37,000 feet. I was pleasantly surprised that it worked well and I didn’t have any issues with connectivity or speed. A few hours into my journey I received contact from my taxi service and confirmed pickup in Bangkok. The $21.95 was well worth the peace of mind. While I don’t think I would need to purchase Wi-Fi again, it is nice to know it is there if you need to stay in touch or make arrangements while traveling. It does restrict the type of internet traffic you can access, so no VOIP or Movie streaming (i.e. Skype or Netflix). The service the cabin crew provides on EVA Air is fantastic. They are attentive, accommodating, and always have a smile. They are an international crew from several different countries which you can tell by the little flag next to the name on their badge. Most speak good English, and I’ve never had a problem communicating with them. There are two dedicated lavatories in premium economy. I noticed they were always clean on the 14-hour flight, so I can only assume that the cabin crew cleans them periodically throughout the duration of the trip which makes a world of difference. They should get hazard pay for this, as I’ve seen the way some passengers treat the lavatory and it isn’t pretty. Passengers in Elite Class are provided with a pair of slippers and a small amenity kit for the flight from LAX to Taipei. The slippers are small and flimsy, meant to keep your feet clean when you walk around the cabin and make a trip to the lavatory. The amenity kit comes with eye cover, socks, ear plugs, a comb, toothbrush and toothpaste, and a few other small items like lip balm and moisturizer. This nice little kit goes a long way to making the long flight more enjoyable. The food and drink selection in premium economy is for sure a step above that served in coach. 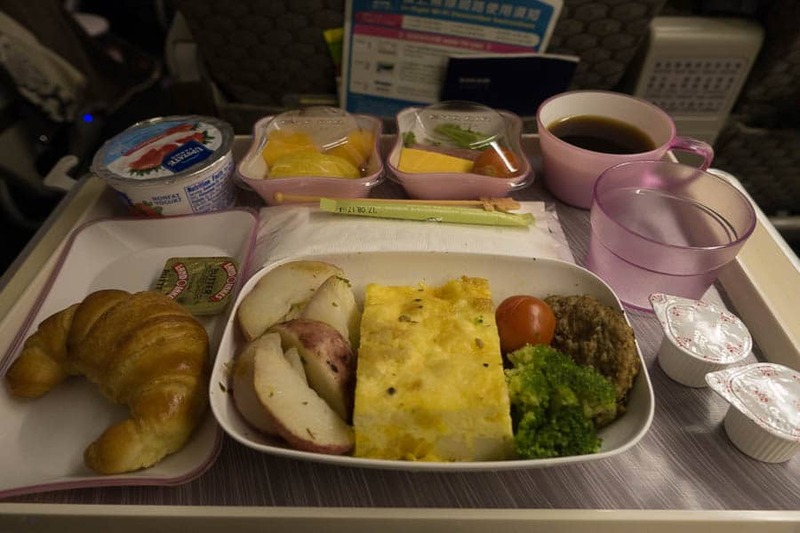 They serve you two full meals and several snacks and drinks throughout the flight from LAX to TPE. I’m sure they have the same service on all their long-haul routes from the U.S. to Taipei, but I can only comment on the legs I have flown. My flight departed just before midnight and within a couple hours after takeoff, the crew was coming through the cabin serving drinks. You can choose from a variety of non-alcoholic beverages as well as wine, beer, and spirits. All of which is complimentary. Then a full evening meal is served. They usually have a selection of a Western Meal and Chinese meal for you to choose from. I always go for the Western style as it suits my palate. 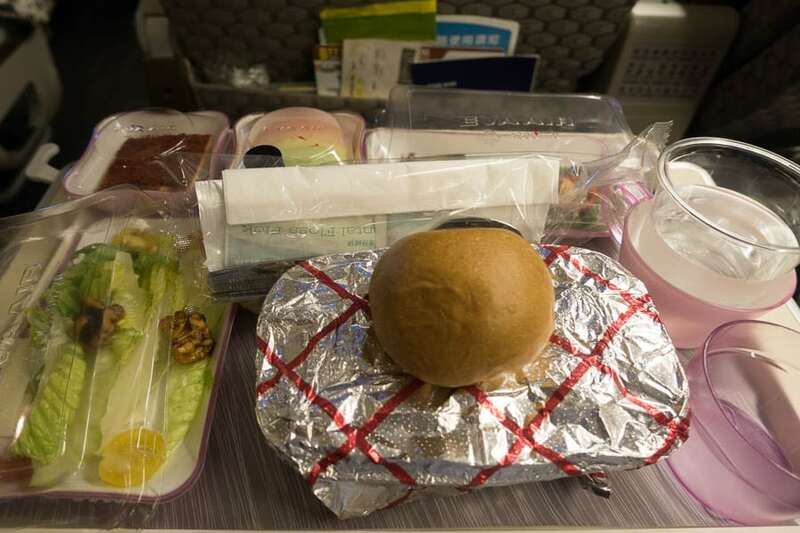 The food is quite good as far as airline meals go and in good amounts that you are not left feeling hungry. After the meal, they’ll make another pass through for coffee, tea, or to refresh your drinks. After they turn the lights down so people can get to sleep, the EVA cabin crew will make frequent stops through the cabin offering snacks, and glasses of water or juice. They also come buy with a small sandwich or snack of some sort, but you need to be awake at the time to partake. If you get hungry or thirsty at any time during the flight you can always ring the bell for the flight attendant and they will take care of you promptly. In the morning, the lights are raised and a meal is served two hours before landing. This is another full meal with either a Western or Chinese style breakfast. Overall I thought the food was good for airline grub and in good portion sizes. I wasn’t hungry during the trip. I found the flight attendants coming through the cabin with juice or water at regular was very nice as I tend to get dehydrated while flying. I really love the in-flight entertainment options on EVA Air. I’ve been flying them for a number of years and was impressed with the systems on the new 777-300ER. The screen is much bigger than the old system and very good quality. It looks like they have embedded an 11” tablet into the seat back in front of you. I rarely use the remote control now as the touch screen works so well on these devices. The selection of movies is great. You get a combination of recent Hollywood blockbusters, classics, Asian movies, TV shows and more. I always check their website to see which movies will be played on my flight and make sure I don’t rent any of them before my trip as to limit my choices. On this flight, I had more hours of movies I wanted to watch than I had flight time. That is always nice. 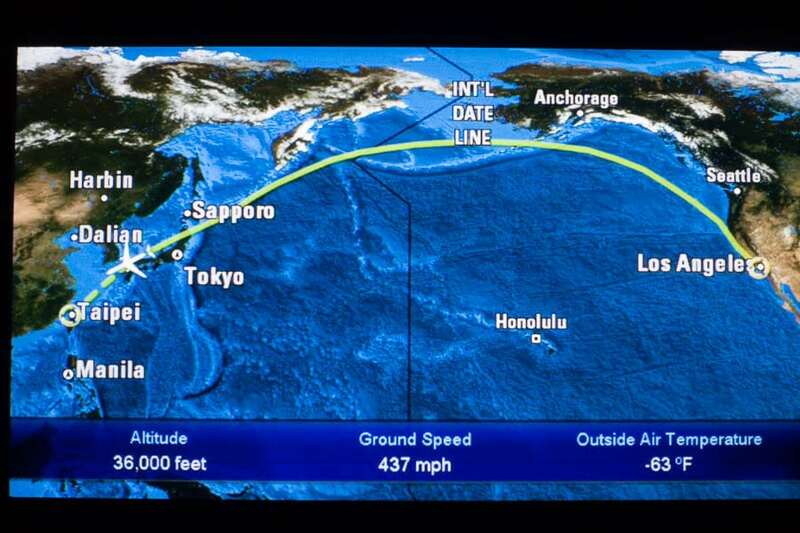 I also enjoy checking my flight’s progress and the route across the pacific. The built in flight tracker gives you an exact picture of where you are as well as pertinent details of times and how much time you have left on your flight. If you have any questions or comments please leave them in the comment section below. I’m always happy to help. Thanks, my family will be flying from SEA to TPE on Eva premium economy, we were anxious to get some details, photos and experiences. You’re welcome Casey, I hope you found it helpful. If you have any other questions let me know, I’ve flown the LAX to TPE route a number of times. Hi. Will they also have Premium Economy passengers use their airport lounge? 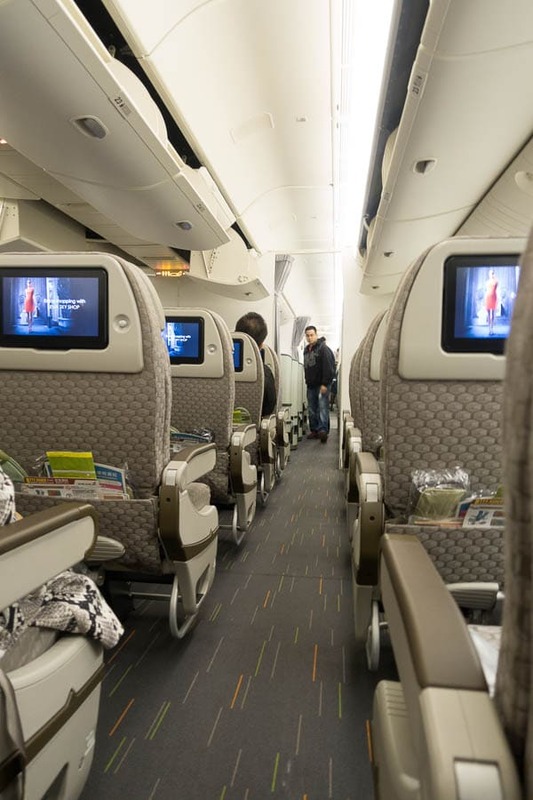 The Premium Economy fare to Hong Kong, while the transfer in Taipei, the flight from Taipei to Hong Kong is on economy class and even the boarding is with the economy class. Will there be any enhancement or the Premium Economy class configuration does not apply between the routing between Taipei and Hong Kong. The Premium Economy Class passenger can they have the privilege to enjoy the club house., if not, can we pay for the privilage and for how much. If you have Silver Star Alliance card, then yes – you can use the lounge. Every time my family try’s to upgrade to premium economy the upgrade cost is 6 to 8 hundred extra per passenger. I have bought tickets from 3 to 6 months before departure date. How do we get tickets for only 4 hundred upgrade cost. We will fly out of LAX or Houston. I pay at least $400 over the regular economy fair – typically more. The flights I’m looking at in November from LAX – BKK are about $550 over the economy price. I find the cheaper they make the economy fares doesn’t necessarily have an equal price drop in Premium Economy prices. I typically book 6 months in advance and have flexible dates which can help finding a good deal. I also watch the airfare prices throughout the year and I’m able to pounce on a good deal when I see one. The other thing is I’ve been traveling this route for 10 years now, and looking back at those prices Premium Economy back then ran me $1,400 – $1,600, but economy fares were much higher. Today I can get Elite Class tickets for $1,200 – $1,400. So in my mind it is still a bargain if I can get on board for around $1,200 even if they drop prices on economy fares to $600 – $700. We are traveling to Vietnam in March 2018. Now elite class in Eva is about $1500 from Chicago. What is your experience as far how early should we buy the tickets? I’m not sure if I have any recommendations for you if you are concerned about when to buy your tickets in order to get the best deal. I’ve researched and read dozens of articles over the years on the topic and I’ve yet to see a solid answer. Personally, I typically book 4 – 6 months in advance because it works with my trip planning. Though I always try to buy my tickets before the seating selection opens so I have the best chance of getting my choice of seats (I believe it’s still 100 days before departure). Other than that if the price sounds reasonable, I go ahead and book – then I don’t check prices again because I’d just be torturing myself if I see they went down. Sorry, I’m not more help. I flew EVA Air Elite class in September from Bangkok to Amsterdam (about 11 hours) and I thought it was superb! So worth the extra money. The stewardesses where the friendliest I think I’ve ever encountered and as you said in your review, those little extras like dedicated check in and priority boarding make all the difference. My wife and I are going to use them again to fly to London next month. We are planning a trip at the end of November returning Jan 3rd. Any advice on specials coming up for that time or should we book 2 tickets Total about $3,600 asap. I know it is the holiday season. This will probably be as good as it gets. EVA looks to be about the best for Preferred seating to Saigon. I will never understand how a few inches of recline and seat width is worth $50 an hour more. the extra $500 + is much better spent when you are Off the airplane and enjoying your vacation. I can understand your point of view. It’s a personal choice. For me, the extra money is worth it. My travel day is over 24 hours with 3 flights and a couple of long layovers. Anything I can do to make that more enjoyable is worth it, as long as I can afford it. Right now I’m fortunate that the extra money I spend on Premium Economy doesn’t have to come out of or impact my ‘on the ground’ budget. If it became an either/or scenario I’d surely reconsider my options. Your obviously not 6’6″ like I am ! i aggree, unless the 33 inch spacing is like being in a sardine can for 11 hours, like on Air China, I thought I was going to die as the ultra narrow seats were designed for chinese women, not european hips. But all the reviews say Air China is 30 inch spacing and EVA is 33 inches in economy. 38 inches for premium economy which is 8 inches different than Air China! My wife and I are flying EVA from Houston Bush to TPE in their Royal Laurel Business Class in December. Our return flight will be in their elite class which looks great thanks to your review! My wife and I typically fly business using miles but due to other travel obligations we had to buy our return ticket using cash so elected to go the more economical route. I am definitely looking forward to checking out this product especially given the 16hr 45min flight time from Houston to Taipei, Thanks again for the informative review. Thanks Tom, I’m glad the review was able to be of help. I hope you have a great flight, and I’m envious of you flying Royal Laurel class, it sure looks nice up there. Can someone tell me if the deluxe class pillows are full size ones, or are they like the economy class cheesy ones? If you mean full-size like the kind you sleep on at home, then no. They are the small airline size pillows in Elite Class. I think you’ll only find the full-size pillows in Premium Laurel with the lie flat seats. Do they serve Haagan Daaz Ice Cream on long haul flights in the summer? I’ll be flying to LAX in Elite in June. Thanks for the kind words. They do serve Ice Cream on the long flights (I believe it is Haagan Daaz), after the dinner meal if I remember right. It’s always been Vanilla and it’s a small cup, but yup they have it. As far as the front row, and this is just my opinion, it isn’t that much better than other seats. Yes, there is extra leg room, but that is also the area they put people with babies and bassinets. You may be stuck near crying baby for your flight. Plus there is no under seat storage. I’ve flown in those seats before, but for me, it wasn’t that much of a difference for me…except no one is reclining their seat in front of you which is nice. And if you have long legs…it might be the right choice. In regards to the inflight snacks, they come by with drinks (water, juice), snacks like chips and crackers, and a small sandwich. As I don’t sleep much on the flights I often take advantage of the offerings. Most people never see it because they are sleeping. Hope that helps. Let me know if you have any other questions and I hope you enjoy your trip. Thank you so much for your prompt and helpful reply! I appreciate your advice- it’s very helpful. Could you please let me know if the front row leg rest for Elite Class is comfortable- as other seats only have a foot rest? Sorry Ethan, it has been awhile since I’ve had the bulkhead seats. I can’t recall how the leg rest were in those seats or if it has changed on the newer 777 they are using on my flights. Perfect, I’ve flown on the bulkhead seats and they offer significantly more comfort than regular premium economy seats. Check out my review on the front row seats. The link is in the comment below! I’m back from a transpacific flight on EVA Air’s Elite Class- your review and question answering were extremely helpful for me to know what I should expect. That being said, after the flight, I’ve also written a review. Feel free to give it a quick read for more details about EVA Air’s Boeing 777-300ER Premium Economy. Hope you like the review. Thank you Peter for your amazing report; it was spot-on. I flew EVA Elite last year to Taipei and Bangkok and was so impressed with their premium economy and wonderful in-flight service, that I’m going again this November. Of all the airlines I’ve flown, I totally agree, EVA is outstanding. Just one comment, when I flew from Houston to Bangkok, (stop-over in Taipei), cocktails were included in premium economy at no additional cost. Any one who reads your report will know exactly what to expect on EVA…Well-Done and thank you! Thanks for nice comments and for sharing your experiences, Paul. Good to hear you’ve enjoyed your flight with EVA as well. They seem to be doing things right. Thank you for the great review. I tried to book the Elite Class for a trip 1-2 months in advance. The website wouldn’t let me pick seats prior to purchasing. I went ahead and purchased, and then tried to pick a seat. All aisle and window seats were taken! Arrghh! I ended up cancelling my flight. Afterwards, I read that the only way you can get aisle/windows seats in Elite is by buying them right when the flight is first announced (perhaps 6 months before). After that, EVA locks up all the choice seats (probably giving them out to good customers or prople with connections). 24 hours before the flight, they release whatever choice seats they have. Have you heard of this? I think that it is true, because they wouldn’t let me pick a seat prior to purchase, and there were no aisle or window seats! Hi Alex, thanks for the stopping by. You point out something that frustrates me too, I don’t like that you can’t see available seats before you purchase. You can book a flight almost a year in advance but can’t start reserving seats till around 100 days before departure (I believe that is the current timeline). Windows and aisle seats seem scarce, and as you mention they block seats for their frequent flyers. And the closer you get to departure, the more likely they will be sold out, it would be nice to see what is available before you spend your money. What I would have done before canceling is to give them a call. In the past, they have ‘found’ me an aisle seat, when the online system shows them all taken. There is no guarantee but is worth trying. All they can say is no, and you have to cancel anyway. At least with EVA they still have a cancellation policy – even though they charge a fee at least you can get your money back – unlike the US based airlines. My personal experience is that I typically book my tickets in advance of the seat reservations opening and set myself a reminder to log on and reserve a seat as soon as selection opens. Except the time mentioned above where I forgot, so I’ve been fortunate to always get an agreeable seat. I can’t deal with the stress of not be able to select a seat. With Cathay, you can select a seat, but of course it’s more expensive. If only I could afford business. Alas, not in this lifetime! 7 JUN 2018 using our agency system/website had no problem assigning my seats before buying the ticket . Thanks for this very informative report! It helps a lot. May I have one or two more question pls? Is the chair of EVA premium economy can be convertible into bed or not? how far is the seat? The seats in Premium Economy do not convert into beds – they just recline a little more than in economy. Can you comfortably sleep in one of their seats? Personally no, I can’t sleep well in airplane seats. These seats recline a little more, are a little wider, and have more legroom than an economy seat – but they are still just airline seats which doesn’t lead to a good night’s rest in my experience. I appreciate your input George. I can’t say I share your longing for the old leg rests, I never found them that comfortable. What do you mean big space between seats? Are you talking the seat next to you or the seat in front of you? I really haven’t noticed the difference, be interested to hear your thoughts. Thank you for the thorough review. I will be flying EVA for the first time next month HAN/TPE/SFO, Elite Class TPE to SFO. After three weeks in SE Asia it sounds like it will be a comfortable flight home. So, you really think these airlines are going to give people a good deal? It is a rip off, but not as much as United ëconomy plus” It is only 5 inches more room nothing else. You are paying more for a little more room. If it makes you feel better then go for it, but it is not some sort of great deal. Thanks for sharing your thoughts, Don. I don’t believe I ever said it was a ‘good deal’, aside from the fact that it actually costs the same or less for the elite class as it did 10 years ago. Which is pretty remarkable. But I do think it is a great deal in this respect, for a little over $1,200 I am able to sit in a chair, sleep, eat, and watch TV while traveling 560 miles an hour in a metal tube that is 37,000 feet above the surface of Earth. I cross the largest ocean on the planet in 12 hours, and in 24 hours I can be in one of my all time favorite places that is located halfway around the world from where I live, sharing drinks and amazing experiences with friends. The first transpacific passenger flight in 1936 cost $799 or $14,000 in today’s dollars and took days not hours. Compared to that, I think today’s travel options are a good deal too. 37,000 miles above the earth……?? lol, Only if EVA now makes Satellites or Rocketships… Nice catch and thanks for pointing that out. Fixed the typo. Hi. We are planning to fly to Manila Philippines from Houston with our 21mos old twins. I need help please. Do they have bassinets for two? Hi Lucille. I’m afraid I don’t know. Best to contact EVA directly and ask. I am flying home from vancouver to jakarta with my 10 months baby, I am thinking to request a bassinet, do u think i should opt for premium economy? If i choose economy with bassinet, will the leg room about the same if i opt for premium economy since the seat will be on the 1st row? I really want it to be a comfy experience but do not want to spend extra mont if there is not muchh difference. Let me know what u think. Thanks a bunch in advance! I’m probably not the best person to give advice on traveling with a baby or bassinet information. Best bet is to contact the airline and ask about it on your particular flight. 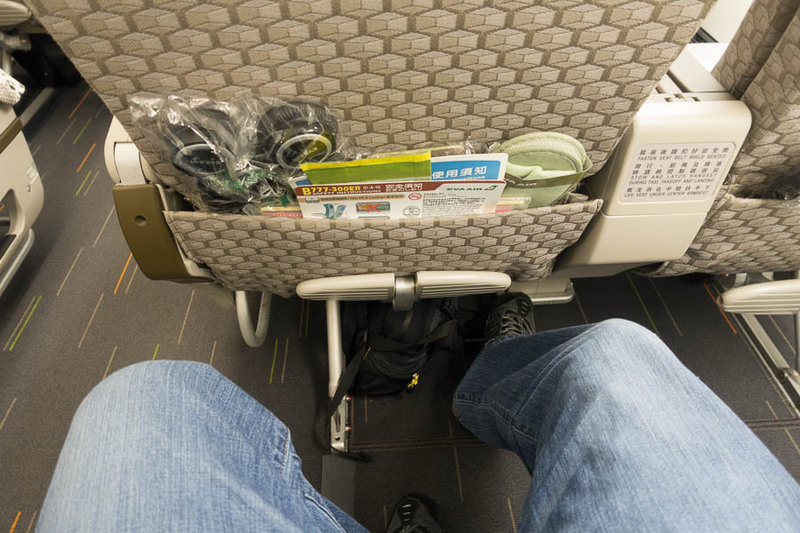 I’ve seen some airlines that have the bassinets attached to the bulkhead wall so they don’t interfere with leg room, but I just don’t know on EVA Air, it’s not something I’ve encountered, except as I pass by on the way to my seat. Hey Peter and everyone else…..Your article was right on the dot. Everything you mentioned is 100% correct. My travel partner and I just returned from a flight (June 14, 2017) from Chicago to Bangkok and back. We were fortunate to book our Chicago to Bangkok flight for $1097 USD via Economy Elite using a promotional fare to unveil their new service flying out of Chicago (Nov 2016). Tho there were only 15 passengers in our cabin, there was added comfort to our cabin of not having it totally full. It felt like we were all alone which was a plus. We were able to move about the cabin and move to separate seats for added comfort. At the time we were purchasing the fares, the economy seats were just under $700 USD but we always fly the seats above economy for the added comfort. I’m thinking about flying on Eva Air in January 2018, when should I buy my ticket? Do you know if you can purchase travel insurance through Eva Air if you decide to cancel? I’m flying from Houston to Singapore stopping in Taipei. Have not flown on a long flight in several years. Hi Roni, I’m not sure I can give you advice on when to buy your ticket if you are talking about getting a good price. Today’s airline’s pricing systems are programmed by people a lot smarter than me. I usually book 4 – 6 months in advance, but I like to have my travel plans sorted well in advance. Hope you enjoy the flight, it is a long one. Peter…hope it’s ok for me to respond…. Roni: We just booked our Elite (super saver) seats today for another trip departing 2nd week October 2017 with a stay longer than 3 months (to Bangkok) so the airfare was about $150 USD more than booking seats for under 3 months stay. (We had been checking for the past 3 weeks from a high $1700 to a low $1550 for elite which we selected. The prices will continue to go up and down depending how many seats remain. When we had been tracking prices in our previous trip (Jan 2017)….it went up starting at $1600, then down, up, then down again….until we locked it at $1097 Elite (Promotion fare unveiling new service from Chicago Nov 2016 when we booked it). If you are looking at Economy seats…..it’s been hovering around low $635 to low $700 USD departing Los Angeles and Chicago….not certain for Houston which is consistent for Economy nowadays. I suggest you look weekly until you are comfortable with the fare you wish to pay. Economy seats may go fast due to low prices and Elite can go fast too when near the departure dates. Stay away from holiday travel dates where the fares are higher (depending on your Jan 2018 departure).. You may wish to sign up for EVA email to alert you for promotion fares too. Also note that Houston has a large Vietnamese population that will use EVA to get to Vietnam so flights may be full if booked at last minute. In summary….Economy seats tend to remain steady and Elite seats tend to be up and down….All seats are held open for Travel agents, consolidators, and airline to book until they fill or don’t fill which reflects the price that we consumer end up paying. Sorry…we never purchased Travel insurance so I can’t comment on it. Great info. Thanks for sharing David! Thank you for the nice and informative review. Do seats have individual a/c vents that can be adjusted? Do you find the elite cabin temp warm, cold, just right? Cheers. Hi Marc. The cabin temperature is controlled by the crew, there isn’t a control at your seat. I think the cabin is cool, which I like, and the blanket provided gives me enough warmth. But I’d rather be cool and use a blanket than it be too warm. Thank you for your informative review of the Elite cabin. Ever sat in the back row against the toilets? If so, how was it? SeatGuru cautions that sitting in this row may be “bothersome”. I want as much distance between me and bassinet row but not if I’m exchanging one nuisance for another. Also, the seat selection process puzzles me. One confirming email told me seats may be selected from 100 days to 24 hours before the flight but when I tried I got a message saying that seats were only being assigned at the ticket counter. I tried to get in a different way and got a message saying seats could be selected online from 24-3 hours prior to departure. Any thoughts? I just booked our Premium Economy on July 29, 2017 for a October 9, 2017 flight returning 4 months later and was able to immediately book our 2 seats (over the wing) for all segments from Chicago to Bangkok and back. This was using EVA online website. We plan to check from time to time to relocate when other seats become available (held for agents, higher elite class, consolidators, EVA, and alike. Perhaps Peter Cook has an answer for your seat selection. “Bothersome” Back row (Economy Elite): Seat does recline towards the back wall. Only issue is the lavatory behind you (middle row), the sound of the toilet flush. The lavatory is for the Elite section only and the sometimes sneaky straggler from the Economy Section. If the Elite section is full….. people may be queue up to wait for the lavatory. If section is nearly empty, then no problem with a queue. The plus is that you know when lavatory is empty for your use. This is what “bothersome” means to me. In regards to not being allowed to select seats within the 100 day mark, I’ve never had that happen. I’d place a call to customer service sooner rather than later and see if they can assign a seat for you. Was wondering about baggage allowance on Premium Economy, compared to Economy. Are you allowed extra baggage in Premium Economy? Would be flying between Toronto and Bangkok. Sorry I didn’t get back to you earlier. Thank you very much for the info and link. That’s good to know. Hi Peter, Can you please tell me, are you not able to book your seats in advance with premium economy on EVA Air? Is it only 24 hours in advance when you check in and is there a way around this? What has your experience been? Thank you in advance ,we are flying in January and I’m booking now. My experience when I book directly with EVA is that I can reserve seats online 100 days in advance up to 24 hours before. They usually tell you about the 100 day window when you book and the confirmation email should have a link to the seat selection site. That has been my experience. I’d call one of their customer service centers if you have concerns. They’ve always been quite helpful to me. Thank you so much! I will do just that! I just booked premium economy seat number about 21… are 21 row near the restroom? It depends on your flight and airplane used. Check out Seatguru.com. Plug in your airline, flight number, and date. It will show you the seat map for your particular flight. Do the premium economy seats for Eva Air recline to the space of the passenger behind you ? China Air premium economy seats have hard shells so when you recline it does not affect the space of the passenger behind you. Planning to go from SFO to MNL both Taiwanese airlines provide roughly same price but layover in Taipei is longer for China Airlines, so I would prefer Eva. Thanks in advance for your response. I can only comment on the flights I’ve been on, the seats on those EVA Air planes did recline into the space behind them. Those seats on the new China Air 777 look nice. I might try them out myself in February. We are planning a trip in October. What bothers me is that you cannot see the seats before paying for the trip. Am I missing something? Of course I’d like to seat beside my wife during the entire trip so seeing the seats before paying is an advantage. Appreciate your review and responses you’ve provided to other passengers. Thanks Mike. Their lack of seat selection is something I wish they would rectify too. I’m going to check out some other premium economy options to Asia and see how they stack up. I just booked 2 premium economy seats. Before I did, I called EVA Air and asked them if there are seats side by side on the 2 seater side and they confirmed it. So I happily booked our flight. Your awesome review of premium economy and the 16 hour flight from IAH to TPE convinced me to pay for the service. Per the chain of comments, you prefer sitting somewhere in the middle. Is that a good seat with big legroom and seat reclines? There’s no difference in the seats. We were just talking about whether it was better to be in the back rows or front rows. One is close to the bassinets, the other the lavatory. I opt for the middle rows, not really near either. Hello – first, GREAT article! My wife and I and our 1.5 yr old are planning to fly to Kuala Lumpur from Toronto using EVA and are going to go with their Premium Economy – and this article rocked! – do you have any idea of the floor space available for the first row with the bulkhead? we’re debating whether its worth it to contact the air line directly (as Ive read thats the only way to get those seats) and request the bulkhead seats. Thank you for the kind words. Unfortunately the arm-rests don’t lift up. I’ve had quite a few flights with no one in the seat beside me and that definitely would have been nice. I’m not sure I can give you any good info on the floor space in the bulkhead row. I’ve only had those seats once and it was a number of years ago. It is nice not having any seats in front of you recline into your space though. Thanks very much for your great review. Can you tell me what seats the entertainment centres are under. One reviewer indicated seats A and K however I have seen a couple of other reviews that complained about the entertainment centre and they were not in these seats. Referring to Elite class and 300ER. EVA runs 4 different types of 777-300 according to Seat Guru, I’ve flown on two different models and the entertainment centers were in different places on both. I’m not sure of a good way to find that information for your particular flight. Thanks for the update Alan. That sounds like a nice improvement if they are letting you select your seats 6 months in advance. Thanks Stuart. I’m afraid I don’t know about the bubbly option in premium economy, I never noticed if anyone was drinking it. Hope you have an excellent trip! Thanks for such a great review. It was so detailed and helpful. We have decided to fly Eva from London to Koh Samui and back for our summer holiday next August. Do you know what degree the premium seat recline was? The main leg of the journeys will be over 12 hours and a decent recline will help us all sleep (I hope). Hi Peter, I have the back row booked on PE VIE to BKK. From what I can tell it is probably a newer version 77B. After much searching online I am getting inconsistent views on whether the seats fully recline as much as the other rows. Do you know? They don’t look great on YouTube. Seem pretty close to the back wall. Thanks. My guess is that the recline won’t be affected in PE, as that be pretty bad when you are paying a premium for these seats, but check out Seat Guru. We will be flying AMS-BKK in summer ’18, Could already reserve seats last month when we purchased the tickets so no more 100 day limit ! In addittion I called customer service to ask for first row seats in Elite Class which could not be guaranteed because there might be someone with a baby but they made a note for us in case there would be no babies. I prefer the leg rest instead of the foot rest. Have flown with EVA lots of times and really enjoy Elite Class ! For me its worth the extra 3-400 euros for a return ticket. Thanks for the updated info, great to hear about them getting rid of the 100 day limit! They do. You get a blanket, pillow, and small amenity kit in premium economy. Hi Joel, Thanks for stopping in. NY to TPE, that’s a nice 16 hours or so, I think you’ll be glad you are in premium economy. I have been in rows without windows before, but as you mentioned I was on the aisle at the time 🙂 . But to contradict myself, I do get excited seeing the city come into view as the sun rises over Taipei. Are premium economy class usually full? Or are there a few empty seats that you can take? We’re travelling with a 2 year old and was hoping we can get another extra seat in addition to hers so she can lie down. We will be traveling from DEN to TPE on award tickets from United Airline and EVA came up as an option. Does anyone know if I will be able to pay an additional fee to get premium economy seats with existing economy tickets? Thank you for the post, it was very helpful. How is the recline in the seats in premium economy? I flew JFK-TPE-PNH in November 2015 and returned in December of 2015 along the same route. I was impressed by EVA’s PE between JFK and TPE but disappointed that I was only able to assign a seat towards the back of the A321 between TPE and PNH, which didn’t have PE seating, given it was a higher fare economy ticket. That said, EVA’s fares are competitive and the extra space is worth the money on a flight of this duration because, unlike, economy, you are not shoehorned into your seat. Those extra five inches of pitch have a remarkable positive psychological effect and make for a more civilized trip. This year I am flying to SIN through TPE on November 22nd on a one-way ticket and am excited to see both aircraft with be the venerable Boeing 777-300ER series with Premium Economy seating. I was also pleased to see they have upgraded the PE interior which, IMHO, is a significant improvement. I will say even at the end of the 14-hour flights, the bathrooms were immaculate and that whenever I fly Trans-Pacific, I will always choose an Asian carrier over an American flag carrier because the planes are newer, cleaner, more technologically advanced and, by enlarge, the crews are enthusiastic, professional and attentive. I don’t mean to denigrate American carriers (my ex-was a Pan Am flight attendant and I have flown mostly on US carriers over 1600 times but it is a fact that Asian carriers have a higher ratio of flight attendants to passengers and there is a correlation between the level and quality of service. I should have been more accurate in my previous post because the scheduled flight time between JFK and TPE is 16 hours and 10 minutes, not 14 hours as I alluded in my post. My apologies for the inaccuracy. Thank a lot for the useful review! I always fly economy. After my last flight with Air Canada on the leg back to Vancouver, say bye to the economy. Their tiny seat is terribly uncomfortable (I have never feel this much uncomfortable flying with EVA , Cathy, ANA, Korean from Canada to Bangkok) . They also let people have too heavy and more than two carryon to the cabin and ended up they didn’t have enough space for all these bags. I had to leave my bag on the floor somewhere at the back of the plan without any help from the flight attendants. I am going to fly EVA premium economy from Houston to BKK next month and will have a review in May. Unfortunately, my expectations will be high after having experienced the now defunct Thai A340-500 premium economy. Great review. I have just one question. Can you say how far back do the seats recline? I am thinking of flying from London to Bangkok in Eva Air which is 12 hours so being able to sleep during this time would be good. Hi did you manage to sleep? Do the seats have a leg rest as well as recline? Thinking of booking PE from London to Bangkok very soon. Aside from the boarding, legroom and dedicated check in line, I honestly don’t see that much difference between Premium and regular economy. Couldn’t you just get an exit row seat? Am I wrong? for me. Will pop a sleeping pill and be off in dreamland, hopefully.